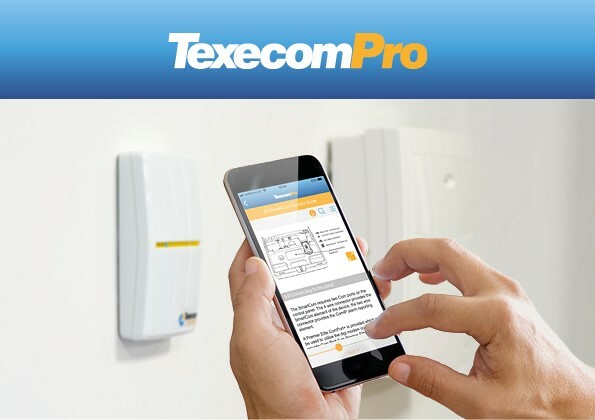 The new free TexecomPro App gives Texecom’s registered installers instant access to the very latest technical product information, manuals, guides, technical bulletins, news, training and other useful material – as well as access to the company’s Installer Forum – all from a mobile device. Easy to use and designed to offer fast navigation, it simplifies the process of accessing relevant information quickly. Users can even save documents in your favourites. No more hunting on the website for product manuals or specification sheets – it’s all on the App. It provides a valuable arsenal of information and support which installers can access directly from a mobile in the field. For anyone new to the Texecom Registered Installer Scheme, they can register straight away either through the TexecomPro app or Texecom’s website. Once registered, they will be sent login information which can be used to access professional installer-only content on the Texecom website or TexecomPro App. TexecomPro is part of an on-going drive by Texecom to offer the industry’s leading level of technical support and customer care. Product information and instructions are accessed by simply scanning the QR code on a Texecom product, which instantly calls up all the relevant information. To make this information easily accessible, all product manuals and specifications are formatted for simple viewing on mobile devices. The App saves time when searching for documents by allowing them to be favourited and easily accessed from a personalised, favourites menu. Users can keep up to date with all the latest Texecom news, with real-time updates and push notifications. Whether it is a new product launch, a software update, a ‘how to’ guide or a new blog post, users will know instantly. With over 6,000 members, Texecom’s Forum is an essential tool for security installers. The App gives access to the Forum directly from a mobile device, so if an installer has a pressing question while on site, they can simply ask their installer community there and then.